The UK’s first fleet of buses to use Opportunity Charging, or Opp-Charge, technology are going into service in the North Yorkshire town of Harrogate, on the weekend of September 1. 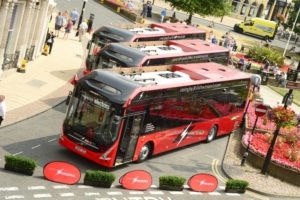 The Harrogate Bus Company, a subsidiary of operator Transdev, revealed its fleet of eight Volvo 7900e electric buses in a ceremony attended by the Buses Minister, Nusrat Ghani MP, and local MP for Harrogate and Knaresborough, Andrew Jones MP. It’s the first full application of ‘Opp-Charge’ in the UK, though trials are also being carried out in Cardiff. Unlike typical electric buses, which need to be plugged in overnight, the ‘Harrogate Electric’ buses take around six minutes to fully charge by taking power from one of three masts now in place at Harrogate’s bus station. The masts use a pantograph attachment to lower a charger onto the bus’s roof, and the long term plan includes siting them at various bus stops around the town as well as the central bus station. Transdev has invested £1.7million into the project and infrastructure, together with £2.25million of funding from the government’s low emission bus scheme.